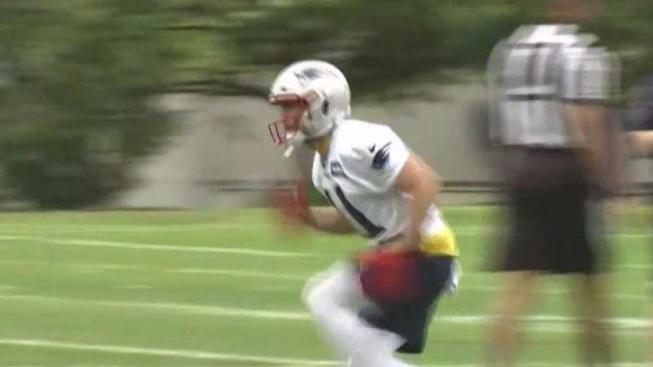 What Banned Substance Did Julian Edelman Test Positive For? Patriots wide receiver Julian Edelman said he is "very sorry," but added he doesn't know what happened to lead to the PED allegations. New England Patriots Nation was stunned last week to learn that wide receiver Julian Edelman had violated the NFL's policy on performance enhancing substances. But it still hasn't been revealed what exactly he tested positive for. According to SI.com's Albert Breer, the substance "wasn't immediately recognizable" and the NFL is still analyzing it. The test was done during the offseason, Breer added, meaning it wasn't a stimulant, as that would have triggered the league's substance abuse policy instead of the performance enhancing substances policy. In an apology issued last week via Instagram, Edelman sounded a bit confused about how he might have tested positive. The online rumor mill is thriving, but not all of the Patriots news has come to fruition. "I am very sorry - I don't know what happened," he said. "I've taken many, many tests obviously over the course of my career, and nothing like this has ever happened." Edelman faces a 4-game suspension for the positive test. He is appealing, but similar suspensions have rarely been overturned. Edelman, 32, was in attendance at last week's minicamp and earlier voluntary workouts as he continues his recovery from a torn ACL suffered in Week 3 of the 2017 preseason that cost him the entire season. This will be Edelman's 10th year in the league. In recent years, he's been one of quarterback Tom Brady's favorite targets. In 2016, his last full season, he caught 98 passes for 1,106 yards and three touchdowns. Over his career, he has 425 career catches for 4,540 yards and 24 touchdowns. The Patriots are scheduled to play Houston, Jacksonville, Detroit and Miami in the first four games of this season.